The Matterhorn is considered by many people to be one of the world’s most beautiful summits. The Matterhorn is certainly the world’s most photographed and easily recognised mountain. It is the goal of many mountaineers and one that is certainly worthy of such fame. 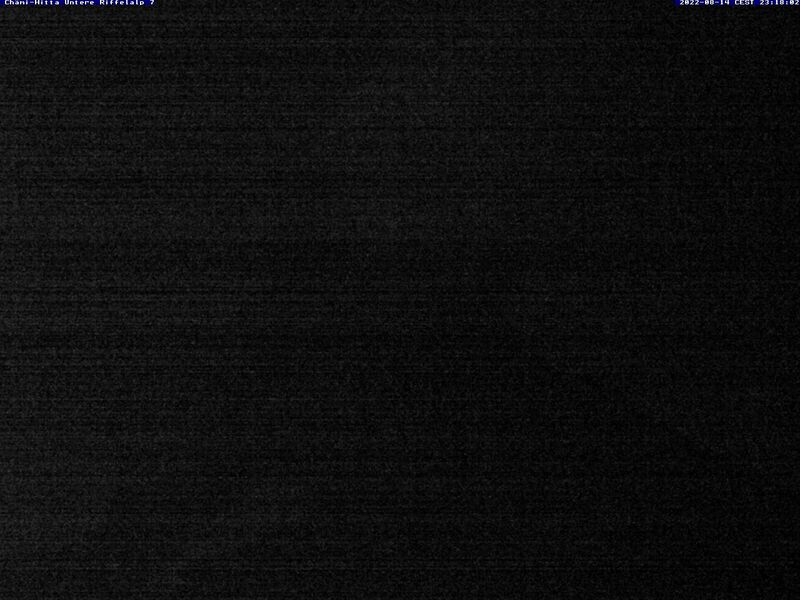 There is a large number people who attempt the Matterhorn each summer season and there is an equally large number that fail. This is usually due to inadequate preparation. The best way to prepare for climbing the Matterhorn is by spending the week doing similar climbs. This will not only help you acclimatise, but also improve your general level of competence and skills in mountaineering. 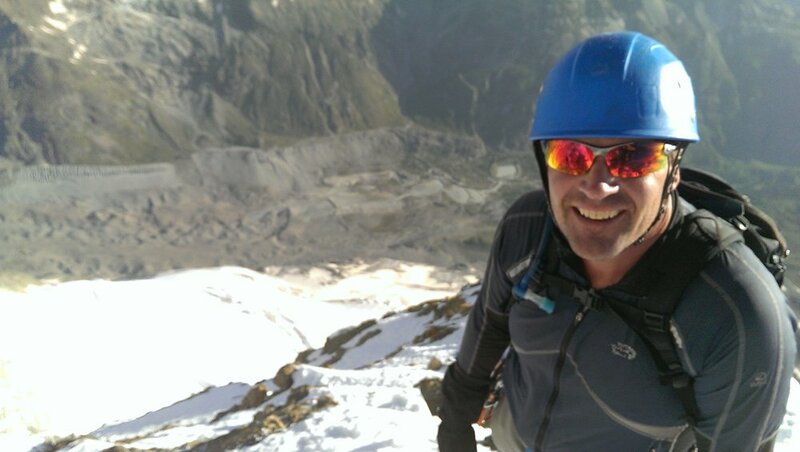 My 7 day program allows for specific preparation on shorter routes of the same nature to better optimise your chance for success and is based in Chamonix. The entire course is run on a 1:1 private ratio and this is in my opinion, the best way to prepare for a technical ascent such as that of the Matterhorn. 7 days - optimised time to practice with the equipment AND acclimate by summitting a 4000m peak beforehand - essential for success. Reserved Huts - Any pre-booked course guarantees that you have your space in the huts. Climbing the entire week with the guide you will attempt the Matterhorn with. 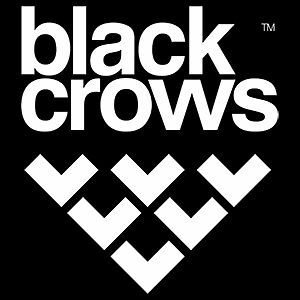 Tried and tested program – practice makes perfect and only by training in similar conditions will you become comfortable and therefore improve your technique. The entire weeks focus has this in mind. Climbing the Matterhorn is a relatively difficult task given that as a team we need to constantly move together all the time. To do this we use a technique called short roping. This means we progress together and use a running belay where needed/possible. The climbing on the Matterhorn is steep and exposed in places and it is very helpful to have a bit of experience with this – especially on the descent as you need to “face out” when heading down to see where to go. In addition to using training climbs for acclimation we will practice on climbs very similar to the Matterhorn during the week to help you get accustomed to these techniques. This part of my course is essential in your bid for success. Today will be your first experience with the high mountains and we get underway with a tram ride to the top of Aiguille du Midi lift station. From the top, we follow a narrow ridge down to the vast glacial plateau. Here we will discuss several topics of concern when travelling on glaciers and practice using our crampons and ice axe. The days journey will most likely see us traverse the “vallee blanche” to reach the Italian border. From here an incredible cable car brings us back to the Aig du Midi and finally Chamonix. Night in Chamonix. Another tram ride today as we take the Funivia Monte Bianco and head out onto the glacier for a stunning ascent up to the Aiguile d”Entreves. This peak offers a stunning thin ridge line and spectacular views to the impressive south side of Mont Blanc. 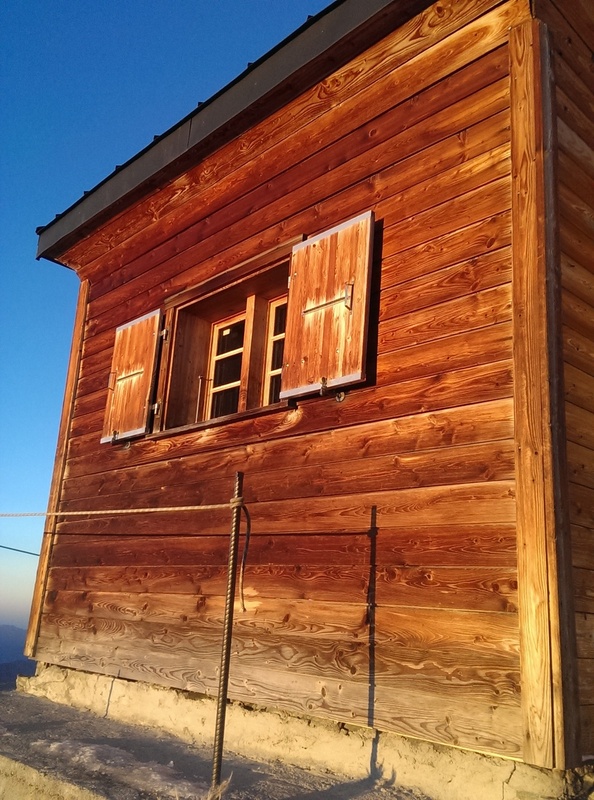 We will spend our evening at the newly refurbished Torino hut. 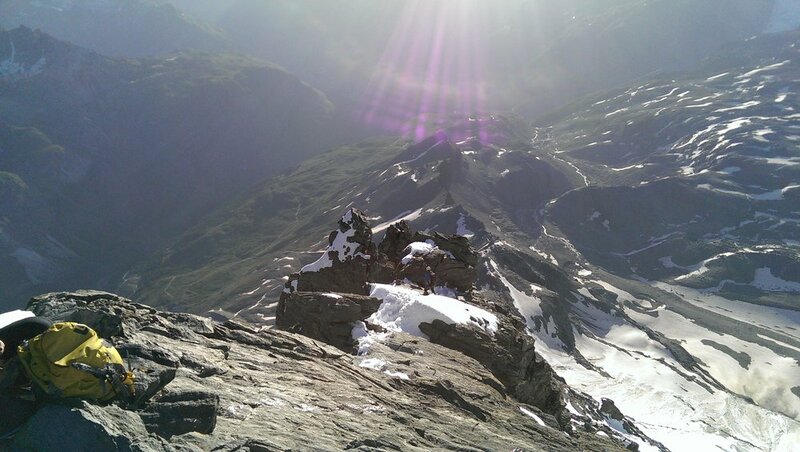 This peak reaching just over 4,000m is a perfect training climb for the Matterhorn. 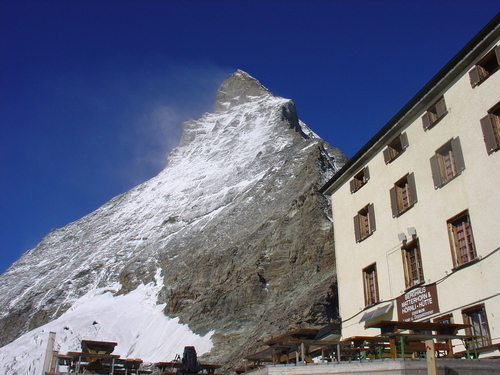 The ascent and altitude make it the ideal test prior to the Matterhorn. The start is early and we cross the a vast glacier to reach some easy mixed ground that takes us to the “salle a manger” located at the very foot of the Dent du Geant. From here the climbing gets more technical and heads up some steep granite, some stretches offering a fixed for help. 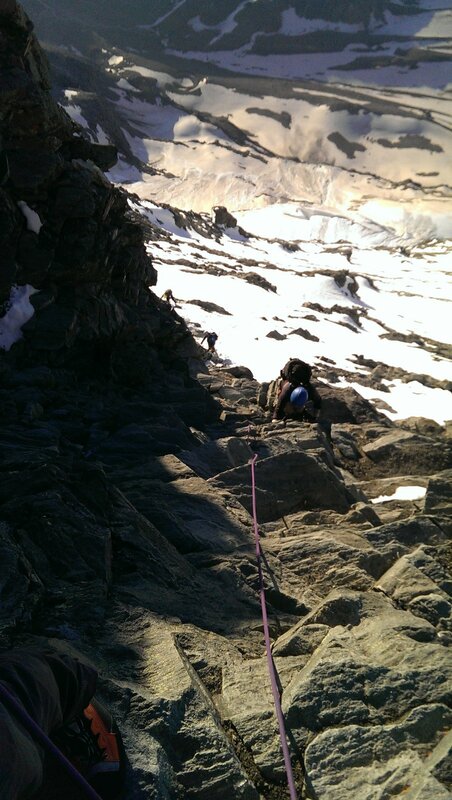 Once we have reached the summit, we have a series of steep rappels that bring us back down to the base of this tooth. We then backtrack our steps to the hut and lift and drive back to Chamonix. Evening in Chamonix. Do a short climb such as the Aiguille de l’M or the Cosmiques Arete. Which climb will depend upon which skills you need to work on most. We will spend time talking about the following days ascent and do any last minute preparations needed that afternoon in town. The idea is to have a short day to and be fresh for the Matterhorn. Following a morning transfer to the car-free village of Zermatt, we will make the first part of the ascent to Schwarzee via the comfort of the high speed gondola in the early afternoon. We then hike for 2h to the newly renovated Hornli Hutte for your first close up view of the mountain. An early afternoon arrival allows us to make a quick visit to the base of the ridge to allow you a hands on feel for the ascent early the following morning. An early dinner and a quick night’s rest follows. The day gets off with the usual chaotic start for a 4am breakfast and rush out the door. The ascent starts all too quickly but we soon settle into a rhythm following the ridge line until just before we reach the Solvay emergency shelter where the climbing gets a bit steeper and harder. After a typical quick break at the shelter, we are off to reach the shoulder and the fixed ropes that allow access to the final snow covered slope and finally the summit. But it’s not time to claim success just yet as the descent will require as much time and effort to return to the Hornli Hutte as the ascent. Only once we have reached the safety of the hut can we properly celebrate with the beverage of your choice! Late afternoon return to Chamonix. For the ascent of the Matterhorn the max ratio is 1:1. *This is a super important detail that pays dividends when on the Matterhorn - you want to know your guide just as much as your guide wants to know you! Meeting your guide the day before an ascent is far from ideal. I don't believe in courses where the climber to guide ratio is different than that of the actual ascent. This is how "guide companies" become greedy....at your personal expense.